The LeEco Super3 X55 is a good television to buy, but not without compromises. LeEco's UI has almost no app support right now and the panel brightness is low. 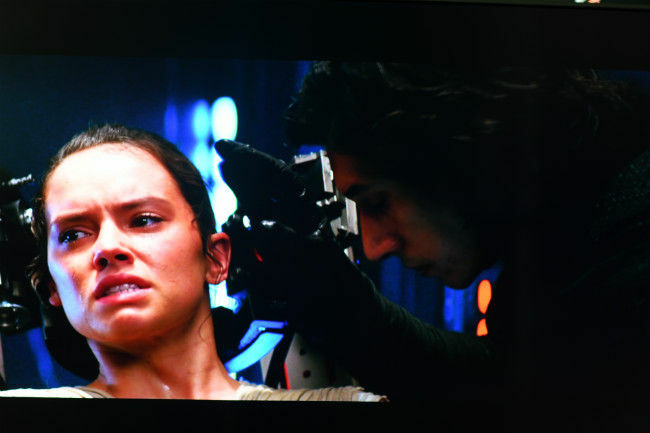 There are ample ports and playback options on the TV, though. LeEco’s escapades in India have mostly been successful so far. Speaking in numbers, LeEco has sold smartphones in minutes, got registrations in thousands, and topped the charts on Flipkart’s stores, continually since entering India. However, the TV market in India is nothing like smartphones, and a flash sale model is questionnable. Yet, LeEco claims that it has received 50,000-plus registrations within a week of its Super3 TV launch on Flipkart. How? We don’t know. What we do know is whether you should be buying LeEco’s Super3 X55 TV or not. First things first, providing 4K at this price point and with this screen size naturally raises questions. How can LeEco do it when no one else can? It is yet another question that we’re trying to answer ourselves. However, the panel quality is really good for the 60k price point. It is dim, but colours look good. The LeEco TV doesn’t have the best black levels that you can get, and LG, Sony and Samsung certainly do better, but comparing to a Panasonic Shinobi Pro (a 1080p TV at the same price), this is more than acceptable. The Panasonic TV, though, is much brighter. The LeEco Super3 X55 achieves a brightness of 293 nits with the backlight set to 100% and Brightness setting at 50%. That’s quite low, and it becomes a real problem when you’re watching movies like Batman, where action takes place at night. LeEco promised 85% of the NTSC colour gamut on this, and our tests returned 71% of NTSC gamut. This, again, is lower than high-end TVs from Sony and Samsung, but given that the TV costs about a fourth of those, it’s again quite acceptable. Practically speaking, colours on the LeEco TV look quite nice. It can run 1080p content at 60Hz, which is more than enough for your TV viewing needs. The colour gamut isn’t as wide as we’ve seen on the ultra-high end TVs, and it’s still a far cry from OLED quality, but it fits the budget easily, just like the Panasonic Shinobi Pro did. Further, compared to cheaper Vu and Micromax TVs, colours on the LeEco TV are better. Its contrast ratio comes to 240:1, which isn’t the highest, but nothing worth complaining either. It is worth noting that the LeEco Super3 X55 cannot run 4K content at 60Hz. To be clear, while LeEco says the TV can decode H.265 4K content at 60Hz, the native panel refresh rate seems to be only 30Hz, for 4K content. Hence, even if the TV shows you such content, it will not be able to actually play it at 60Hz. Connecting the Asus G20CB powered by Nvidia GeForce GTX 980 GPU, the maximum refresh rate was locked at 30Hz. This is a common problem with cheaper 4K TVs, like those offered by Vu, Micromax etc. We tried the same test on two TVs from LG and Sony respective, and 4K content ran seamlessly at 60Hz. This means that 4K content is limited to 30fps due to the panel's native refresh rate, which means that you will have to deal with judders. At this point, it is also worth mentioning that LeEco offers a 4-year warranty on the panel, and two-year warranty on the rest of the television. One problem with the picture quality, though, is that there’s little control to the user. Accessing Settings, you get the basic brightness, backlight, contrast and some other functionalities, but nothing for an enthusiast to play around with. Also, LeEco’s Live TV services are questionnable, which we shall discuss in the section below. The Super3 X55 has two 10W speakers, and Dolby Audio optimisation. It’s loud enough for small to medium-sized rooms, and at higher volumes, can even suffice a 24x13-square foot room. The audio is somewhat flatter than what you would ideally require for viewing pulsating videos and movies, but it’s good enough for clear voice delivery. Another very impressive aspect of the LeEco Super3 X55 TV is the wide array of ports present on it. 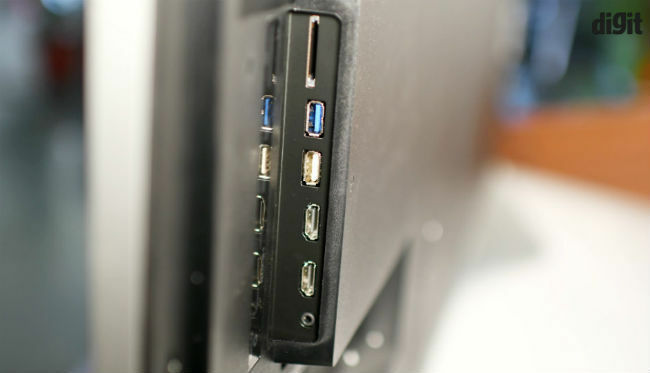 All the HDMI ports are on the side, and they’re HDMI 2.0 ports, so all can support 4K video. You can even use the two USB 3.0 ports to play 4K movies through hard drives and other external devices. The presence of two USB 3.0 ports is above industry standards, and most manufacturers provide just one, while Samsung doesn’t provide even that on its 55-inch SUHD TV. Given the lack of apps (which we shall discuss later), this is very important for using the 4K capabilities of the television. The LeEco remote with the TV is quite simple, with just-about-enough buttons needed for navigation. The voice function is currently under development, so you won't be able to use it, but the other buttons are tactile. There's also a Le button that allows you to take screenshots, etc. LeEco’s whole business model revolves around providing content, and it gives the company a big edge over its customers. These content services add value to LeEco’s phones, but they are even more relevant on the Super3 TVs. You get the Le Live and Le Vidi apps, which can provide movie streaming and Live TV respectively. However, the quality here was often unimpressive. While Le Live is the more usable of the two, it has virtually no English movies. It may make sense for the Indian audience, and the Bollywood library from Eros Now is quite large, but if you are interested in Hollywood movies, you will be disappointed. Also, Le Vidi tends to buffer at times, and we would recommend a low latency 10Mbps connection if you’re buying this television. It’s also worth noting that Le Vidi doesn’t stream in 4K. Content can look really bad on YuppTV's Live TV services. Further, Le Vidi, which provides live TV support is somewhat handicapped by YuppTV’s service. If your Internet connection is bad, live television will look really bad on this TV, and the resolution never reaches even close to 1080p. Thanks to the good quality panels, the colours are nice, but watching live television on LeEco’s TV is not advisable unless you have a set-top-box. 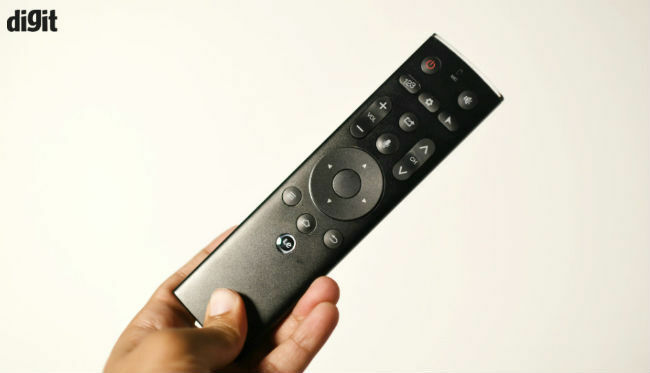 YuppTV’s services often simply refuse to stream altogether. The LeEco Super3 X55 television runs on Android Lollipop, layered with eUI 5.5. It’s worth noting that this isn’t the Android TV interface that Sony employs, but it solves a very important issue with TV interfaces - LeEco’s UI is extremely fast. 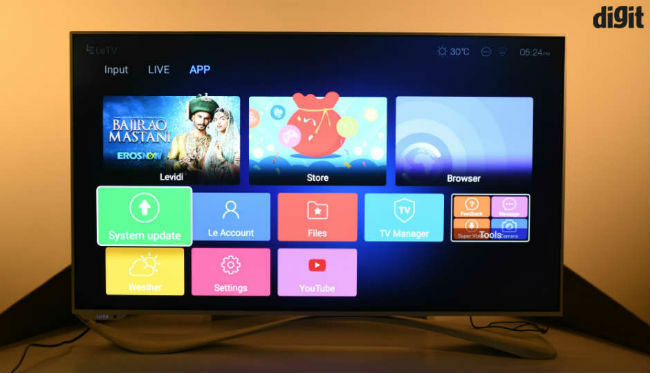 The TV runs on a Cortex A17 quad-core processor, and switching apps, loading new ones and shifting between screens is really smooth and responsive. It’s something that most TV OSes are trying to get better at. Having said that, eUI’s Achilles heel is in the fact that it has virtually no useful apps. Barring Eros Now, which is integrated into Le Vidi, we couldn’t find any other streaming service in LeEco’s store, including Netflix. Of course, you can download YouTube, but that’s all that we could find. There are some games and other apps, like Musixmatch, that you can download. Overall, eUI is fast and easy to use, but still needs some work. LeEco needs to ensure more apps are added as soon as possible. You can connect a Chromecast for better app support. We tried it, and Netflix looks great on this television. The build quality and design language on the LeEco Super3 X55 are worth appreciating. 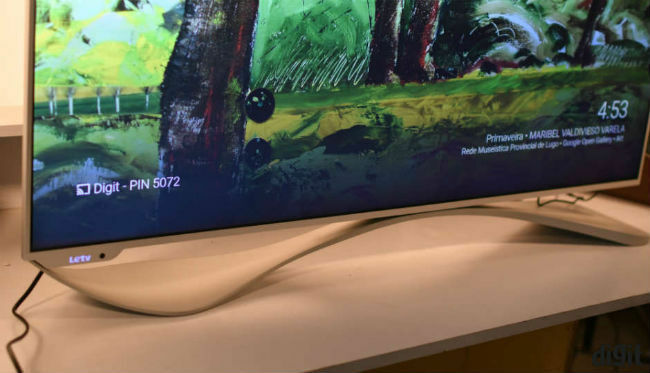 LeEco’s Yoga stand looks nice, and fits to the TV on two ends at the bottom. Once fixed, it holds the TV without any screen wobble, and gives it a striking look that no other TV provides. The TV looks unique on a table, thanks to the stands. It’s not the thinnest television, though. While 15.5mm may sound thin, the LeEco Super3 X55 is not the thinnest TV that you can buy. That said, you still get a thin profile, and wall mounted, this TV will look great. The chrome finish on the sides add a touch of premiumness, and overall, the TV looks better than competing televisions from Vu, Micromax, Panasonic and more. Just like LeEco’s smartphones, the Super3 X55 television also provides a very good value proposition. At Rs. 59,790, it’s a good television to buy, but there are compromises that have been made here.